STING (stimulator of interferon genes), alternatively known as MPYS, TMEM173, MITA and ERIS, is a key sensor of cytosolic nucleic acids. In the past year, an incredible amount has been revealed on the biology of STING. As the studies were published, the complexity of STING became apparent. STING, initially thought to serve solely as an adaptor protein for mediating signaling by cytosolic DNA sensors (CDS), was recently found to be a direct sensor of cyclic dinucleotides (CDNs) . CDNs are ubiquitous second messenger molecules used in bacterial signal transduction and are defense triggers in mammalian cells. Upon bacterial pathogen attack, CDNs released into cells bind directly to STING leading to TBK1-mediated IRF3 activation and type I IFN production. Cyclic diguanylic acid (c-di-GMP) is the most prevalent intracellular signaling intermediate in bacteria. Other functionally important CDNs include cyclic diadenylic acid (c-di-AMP)  and the recently identified cyclic adenylicguanylic acid (cGAMP) . A highlight of the year was the back-to-back discovery of metazoan cGAMP and the enzyme cyclic cGAMP synthase (cGAS) [3,4]. Mammalian cells synthesize cGAMP in response to cytosolic DNA interaction with cGAS. Increasing evidence now places cGAS as the critical cytosolic DNA sensor. Surprisingly, certain cells are able to respond to cytosolic DNA and the cGAS product but are poorly responsive to direct administration of cGAMP. With several close structural examinations, another key discovery was made. Metazoan cGAMP is structurally distinct to the bacterial cGAMP [5,6]. Metazoan cGAMP contains [G(2′,5′)-pA(3′,5′)p] phosphodiester linkages, whereas bacterial cGAMP contains [G(3′,5′)pA(3′,5′)p] linkages. Thus arose the nomenclature 3′3′-cGAMP for the bacterial “canonical” cyclic dinucleotide, and 2′3′-cGAMP relating to the mammalian “noncanonical” cGAS-produced cGAMP. The latter cGAS-produced cGAMP was found to bind STING with stronger affinity than bacterial cGAMP, inducing a robust IFN response [7,8]. Interestingly, a variety of natural variants of human STING (hSTING) have been identified . The presence of non-synonymous variants of hSTING, some in high frequencies is indicative of its implicit role in disease. It is important to be aware that variant hSTING alleles differentially respond to cGAMPs. Several of the aforementioned studies were performed on the hSTING allele containing the H232 allele and not R232 that is now known as the wild type hSTING prevalent in ~60% of the population. Furthermore, the variant hSTING haplotype (HAQ) found in the THP1 monocytic cell line has low intrinsic activity but responds to bacterial and metazoan CDNs. Very recently, a splice variant of hSTING, named MRP, has been identified in HeLa and 293T cells that acts as a dominant negative regulator of STING-mediated IFN production . The STING variants (alleles and mutants) and different forms of CDNs are powerful tools to further understand STING biology. Important lessons have been learned the hard way. A small molecule DMXAA (Vadimezan or ASA404) that failed in phase III clinical trials in combination with chemotherapy, was found to stimulate STING signaling in mice but not in humans . Together, these studies underscore the careful attention required when it comes to conducting experiments and interpreting the role of STING. 1. Burdette DL. et al., 2011. 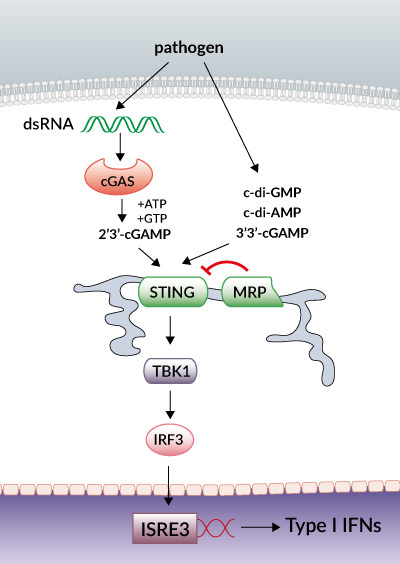 STING is a direct innate immune sensor of cyclic di-GMP. Nature 478(7370):515-8. 2. Woodward JJ. et al., 2010. c-di-AMP secreted by intracellular Listeria monocytogenes activates a host type I interferon response. Science 328(5986):1703-5. 3. Wu J. et al., 2013. Cyclic GMP-AMP is an endogenous second messenger in innate immune signaling by cytosolic DNA. Science 339(6121):826-30. 4. Sun L. et al., 2013. Cyclic GMP-AMP synthase is a cytosolic DNA sensor that activates the type I interferon pathway. Science 339(6121):786-91. 5. Ablasser A. et al., 2013. cGAS produces a 2'-5'-linked cyclic dinucleotide second messenger that activates STING. Nature 498(7454):380-4. 6. Civril F. et al., 2013. Structural mechanism of cytosolic DNA sensing by cGAS. Nature 498(7454):332-7. 7. Gao P. et al., 2013. Cyclic [G(2',5')pA(3',5')p] is the metazoan second messenger produced by DNA-activated cyclic GMP-AMP synthase. Cell 153(5);1094-107. 8. Zhang X. et al., 2013. Cyclic GMP-AMP Containing Mixed Phosphodiester Linkages Is An Endogenous High-Affinity Ligand for STING. Mol Cell 52(2):226-35. 9.Yi G. et al., 2013. Single Nucleotide Polymorphisms of Human STING Can Affect Innate Immune Response to Cyclic Dinucleotides. PLoS One 8(10):e77846. 10. Chen H. et al., 2014. An Alternative Splicing Isoform of MITA Antagonizes MITA-Mediated Induction of Type I IFNs. J Immuno doi: 10.4049. 11. Conlon J. et al., 2013. Mouse, but not human STING, binds and signals in response to the vascular disrupting agent 5,6-dimethylxanthenone-4-acetic acid. J Immuno 190(10):5216-25.